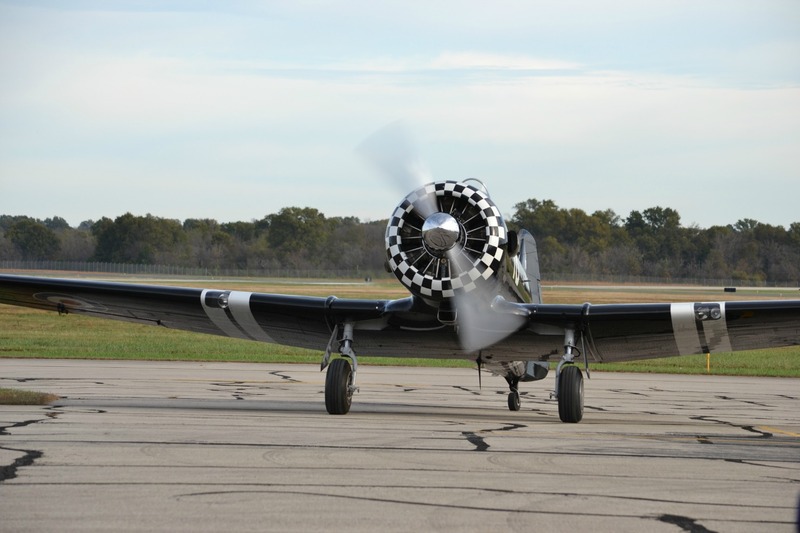 Today (November 5th) at the Atkinson Municipal Airport in Pittsburg, I attended a Veterans’ Appreciation Warbird Fly-in. It was nice for several reasons. I didn’t have far to go – the airport is abut two miles from where I live. I’ve never seen so many people at the airport and never seen such an interesting gathering of types. It was a very pleasant morning and my thanks to all the folks who made such an effort to put it all together. It would also be appropriate to remember all the veterans who were there, and those who weren’t. All the photographs in this blog entry are my own work and licensed under a Creative Commons Attribution-NonCommercial-ShareAlike 4.0 International License. 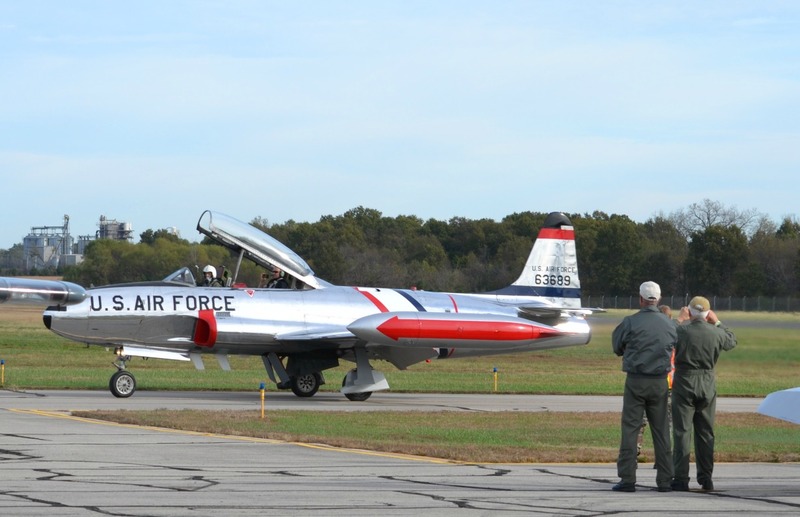 One of the three T-6s in attendance. This one is interesting having “modern” RAF roundels and the crest of No 1 FTS (the oldest military pilot training school in the world – celebrated its centenary in 2009) on its rudder. It wears an all black scheme reminiscent of the Tucanos currently flown by 1FTS at RAF Linton-On-Ouse, Yorkshire. 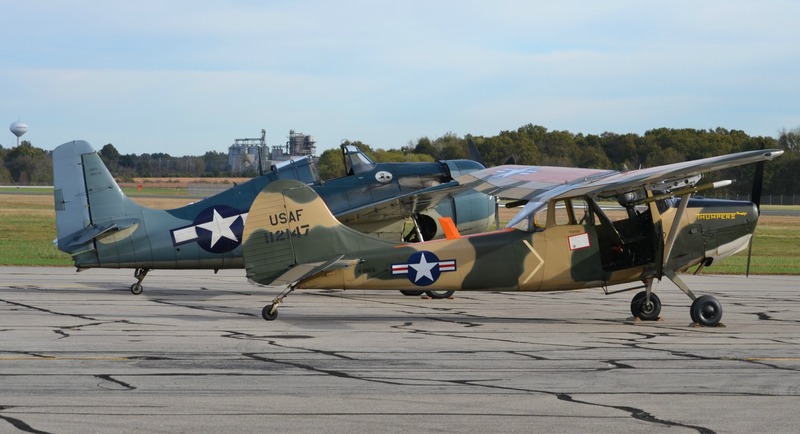 Grumman FM-2 Wildcat N551TC and Cessna 0-1/L-19A ‘Bird Dog’ 51-12167 N5242G – Veterans of different wars, together at the Atkinson Municipal Airport, Pittsburg, KS. FM-2 Wildcat Bu.47160 N551TC. This example has had quite a life postwar. 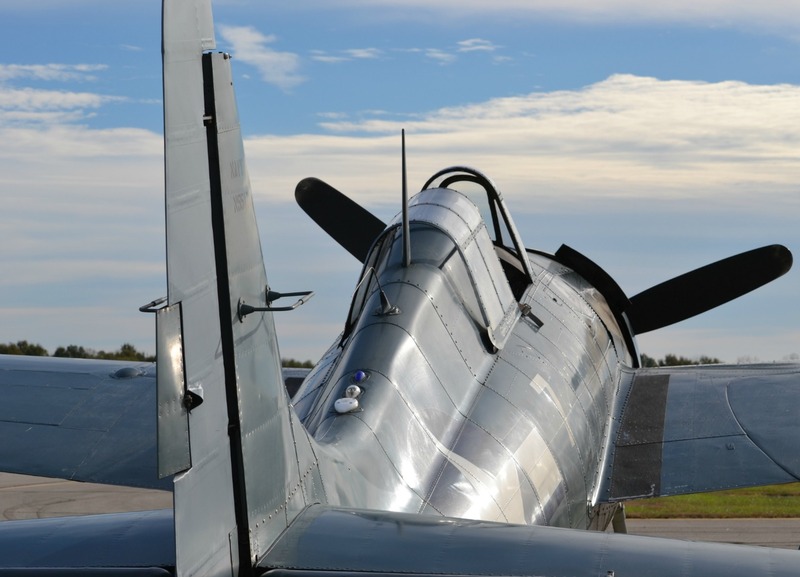 According to the Warbird Registry it was used as an instructional airframe by a trade school in Montana between 1950 and 1956, at which time it was sold and converted to be a crop sprayer. It seems to have been rescued and restored again in the early 1970s. 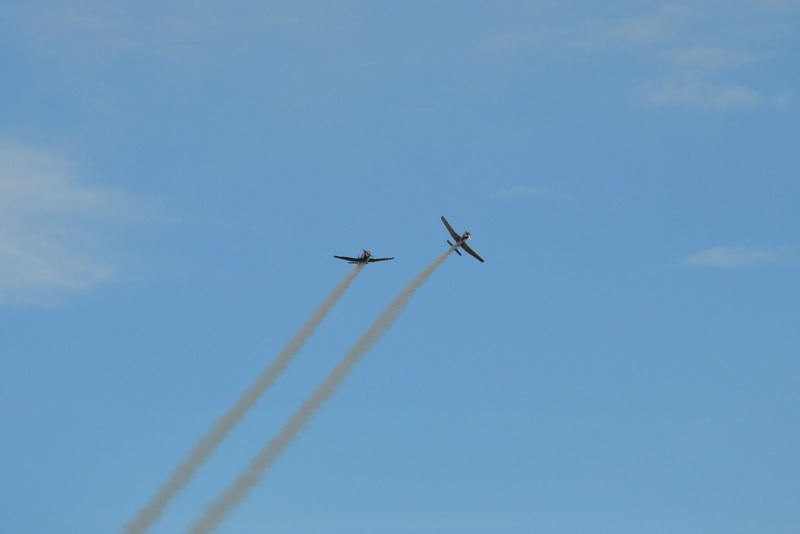 There are certain anniversaries that I would like to cover, and I haven’t looked at This day in Aviation yet. On 2nd November 1947 the world witnessed the first and only flight of the Hughes H-4 “Hercules” NX37602 better known as the “Spruce Goose” even though it was largely made of birch. Intended to carry 750 troops across the Atlantic, it was revolutionary in its construction, being of birch and resin composite, and aroused much controversy and speculation as the project lagged. It’s probably a measure of Hughes’ capricious nature that having proved the concept, the H-4 was shelved after its first and only flight. A Hughes crew maintained the aircraft in flying condition in a climate-controlled hangar, but this crew was reduced in size over the years and disbanded entirely after Howard Hughes’ death in 1976. The Aero Club of Southern California put the aircraft on display in 1980 in a large dome adjacent to the RMS Queen Mary. The Walt Disney Company acquired both attractions and some years later told the aero club it no longer wished to display the Hercules. The aircraft was transported by barge, train, and truck to its current home in McMinnville, Oregon at the Evergreen Aviation and Space Museum, where it arrived on February 27, 1993. 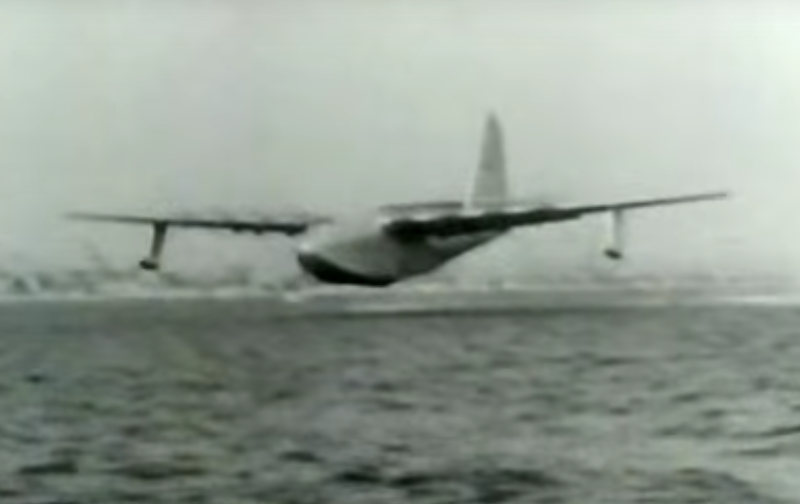 Some nice footage exists of the H-4 on YouTube, including this documentary excerpt. Just occasionally, my casual browsing dredges up something unexpected, interesting, and aviation-related. A couple of days ago, on Saturday (October 29th) it seems that Lufthansa flew their last commercial flights using the Boeing 737. The 737 is known as ‘Bobby’ or ‘Bobby Boeing’ by Lufthansa, who were the launch customers of the type in the late 1960s. ‘Bobby’ is being replaced by what Lufthansa describes as “quieter and more fuel efficient” equipment produced by Bombardier and Embraer. Lufthansa press releases also mention the present and future line of Airbus products as replacements for ‘Bobby’ on some routes. This Ken Fielding photo from 1972 shows a Lufthansa 737 in an early livery and, as Ken says, it’s notable for the logo of the 1972 Munich Olympic Games on the aft fuselage. Lufthansa Boeing 737-130 D-ABEA Seen at Manchester airport (UK) on July 31st 1972. It first flew on May 13th 1967 and was delivered to Lufthansa on April 24th 1968. After later service in the USA and New Zealand it was scrapped in the USA in 1995. Should you desire to brush up on your German, here’s a YouTube video from a group of German plane-spotters commemorating the event. Its is, as they say a slightly sad event as an original customer retires a machine that was once the backbone of its short-haul fleet This is not simply auf wiedersehen, it’s farewell, Bobby.